AkmalHussin.com: 503,000 oz of gold deposit in Kelantan - owned by Singaporeans ! 503,000 oz of gold deposit in Kelantan - owned by Singaporeans ! 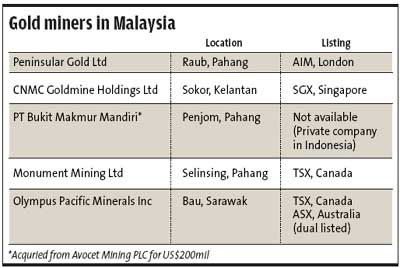 CNMC Goldmine Holdings Ltd, which public listed company in Singapore, currently has a gold mine in Kelantan, Malaysia as well as an ore processing facility. Its mining rights to the area, which covers 10 square kilometres, expire on April 7, 2018. The company expects to produce 6,000 ounces of gold this year, with output rising to 31,500 ounces next year and 58,100 ounces by 2014. Chris Lim, CNMC's CEO, said the firm's cost of production is estimated at $450-$550 per ounce, way below the current market price of spot gold which is around $1,650 an ounce. The Minerals and Geoscience Department of Kelantan has approved the development of CNMC Goldmine Holdings’ heap leach gold recovery scheme at its flagship Sokor Gold Project in northern Malaysia. 1The green light means CNMC can begin an immediate trial run of its heap leach production operations using a stockpile of about 90,000 tonnes of gold-bearing ore. The heap leach scheme is the largest of CNMC’s three gold recovery sites at Sokor, with a monthly throughout capacity of 100,000 tonnes. The Sokor gold field project’s first gold pour was achieved in July 2010. The 10sqkm site hosts four identified gold deposits - Manson’s lode vein, New Discovery vein, Sg Ketubong target and Rixen target. Sokor has a JORC compliant resource of 8.59 million tonnes @ 1.7 grams/tonne gold for 503,000 contained ounces of gold. It is considered to be the next most prospective but undeveloped hard rock gold mining area in Malaysia. Once developed, CNMC says it will be one of the country’s largest gold mines. 2012 has been a year of milestones for the company, with its maiden profit of US$480,000 reported in quarter 2 and gold production during the same quarter increasing by 65.3% to 1,314 ounces.